We’re constantly being reminded in New Zealand not to ‘drive tired’ and ‘take a break every two hours when travelling’, but next time you reach for that Red Bull or coffee hit on the highway, spare a thought for some of our feathered summer tourists. Travelling the length of Aotearoa tip-to-tip would be an impressive feat for anyone at 1600km, but try doing nearly seven times that distance without so much as a pie and an L&P en-route, and you have the astonishing migration of the Bar-tailed Godwit. It’s easy to overlook these unassuming wading birds in their current garb of mottled brown, but they’re actually on a winter vacation in New Zealand before slipping into dazzling breeding attire for the Arctic summer. 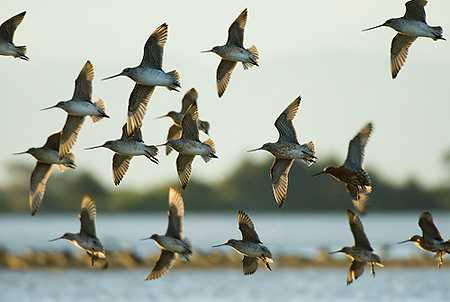 However whilst most of us would be happy with a few days holiday in the Bay of Islands, the Bar-tailed Godwit is a truly globe-trotting tourist travelling from NZ to the roof of the planet – Alaska – each year. Like most of us on holiday they always put on a little weight, but in their case for good reason, as they undertake their non-stop trip of 11,500km from Alaska to New Zealand, in a staggering 8 days. For that epic journey, you can perhaps excuse them turning over half their bodyweight into fat! 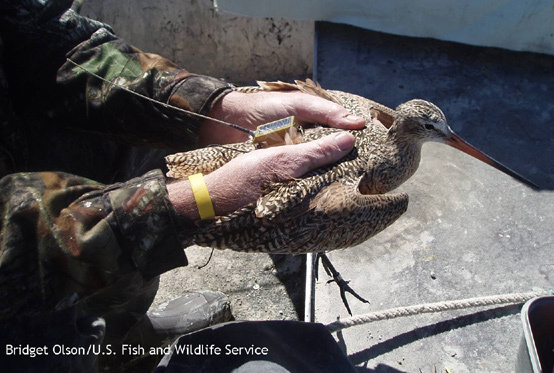 How we know all this is a marvel of modern technology, with the use of global positioning satellites (GPS) tracking a handful of godwits with transmitters as they flap their way north and south each year. Once too bulky to attach to smaller birds, a new generation of feather-light solar powered GPS systems that weigh in at around 12 grams have allowed birders new insights into this feathered nomad. At their summer and winter hang-outs they’re also told apart from the thousands of other godwits by an array of standard metal and coloured leg bands, which conservationists can observe with binoculars. So now is the time to catch a glimpse of these record breakers before they leave our shores, but don’t forget to give them a wide berth at the beach or estuary, so they make a clean break. And while you’re at it take the time to marvel at the fact that when these birds set off on this spectaular journey, they won’t be touching down for nearly 150 hours. I’m a worried that the godwit’s journey maybe a little more trechearous this year, given that their watery stop-off may have all but dissappeared – http://blog.forestandbird.org.nz/epic-migration/….Has there been any more news on this?